I think I’ve been doing more taking than giving for the last few days, and it will continue for at least another day. A couple of weeks ago, I decided to redeem points from the various credit card company rewards programs that I participate in. You never know when they might arbitrarily end the programs, or almost as bad, discontinue the good rewards. Instead of being in a gift-y mood and passing out several Amazon gift certificates, I gave only one Amazon certificate to my husband, and spent all other available points on a Flip Mino mini digital camcorder for myself. Mine, all mine. I would normally choose an expensive, whiz-bang “real” camcorder. But there is something to be said for something small, fun and simple that fits in a pocket and will definitely get used, even if only for dog and cat movies. Oh, and that didn’t cost any “real” dollars. It arrived just in time for my upcoming road trip, in which I finally get to see my Axel in the show ring. I just hope I can find a spot where I can film him without him spotting me and ruining what I am told is some great ring presence in my absence. Also, my wonderful husband bought me a new laptop to replace the almost-six-year-old one I sort of complained about back in January. It is a pretty dark red Sony VAIO VGN-CS290JER. To make it even better to my shallow self, it not only color matches to my digital camera, BlackBerry case, and Bluetooth headset (and probably other electronic stuff I am forgetting), it came with a color matched wireless mouse. Life is good. Mostly good, anyway. I’d forgotten what a task it can be to get a new computer set up just perfect. It’s going pretty well so far as this computer wasn’t loaded with as much junk and trial software as the last two that came my way. And tomorrow I pick up the much-needed replacement to my 11-year-old minivan. Because I had a pretty small budget and apparently not much imagination, it’s another Dodge Caravan. Grand Caravan this time, as they no longer make the short wheelbase Caravan, and blue, because when you buy out of dealer stock on the second-to-last day of the special offers period, there is no chance of getting a dark red anything. At least that has been my experience. So if giving to myself counts, I’ve got our March NaBloPoMo theme well covered. Stay tuned for some less self-indulgent posts as the month goes on, I hope. Oh! Can’t sign off without an Axel update. There wasn’t much Axel love at the Deep South shows, although he did bring back a few reserves and placements. He got back in the groove this weekend though with two more wins and two more points. Total points now: 5 of 15, no majors yet. He is basically 1/3 of the way there! I hope I am making the right decision to give him a break after next weekend. More about that during the week to come. Because I am so lame, I have been visiting the AKC site every day once a week had passed since Axel’s show debut weekend, waiting to see evidence of his official points progression. Never mind that the website clearly states that it could be several weeks before points are officially recorded. I was quite busy at work on Monday and Tuesday, brought work home on Monday evening, and had no internet at home on Tuesday evening. So today during lunch I finally had a moment to check again. Look! For those who remember that I said he has three points, apparently his point for the February 1 show did not make this report. Of course we made some time to watch the Westminster Kennel Club show on Monday and Tuesday nights. The internet has made this event better for me, since Westminster KC now provides streaming video from each day’s breed judging. 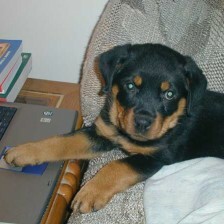 Rottweiler #10 in the breed judging video is Freya’s half brother Odin, by the way. I always enjoy watching the TV broadcast of the group judging, particularly the Working and Herding groups. I was pleased to see 10-year-old “Stump” get Best in Show and his moment in the spotlight, but I honestly don’t know enough about the Sussex Spaniel standard to make any intelligent comments on the win. One tweet that left me perplexed was one where someone wondered why none of the female handlers wore high heels. Umm. I hope the tweeter was watching the Toy group judging at the time they tweeted. In the other groups, it would have been evident that you have to run down and back, and around the ring, with your dog. Personally, any scenario I can come up with that involves a show ring, my dog, running and high heels does not have a happy or pretty ending. I was watching rather than tweeting myself, except for a tweet in which I wondered who the new co-announcer was. I really did not care for her at all. I haven’t been to a dog show myself in quite a while. I’d like to visit Axel this weekend, but so far it’s not looking good for that. Maybe I’ll go to the International Kennel Club show for the first time in several years the weekend following, though. 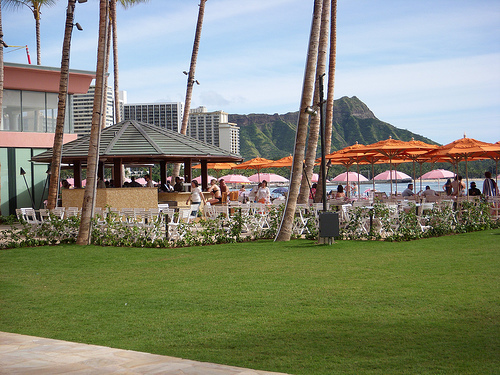 I have always loved that pink hotel, the Royal Hawaiian Hotel. The hotel was closed for a major renovation last year. Certain areas began reopening at the beginning of January, and the grand re-opening is set for March. Banquet facilities and more guest rooms were opened a few weeks ago, featuring a gala inauguration ball on January 20. However, with the full re-opening over a month away, it seemed like a good idea to make sure all was well for our personal vacation tradition of having a drink at the Mai Tai Bar on the last night of our stay. Looks like they still have more work to do, but we’ll be able to enjoy some cocktails here on Tuesday evening. The photo links to a few more Royal Hawaiian photos. If you like pink, that is. And not to forget Axel. Final update for the weekend: Sunday, Winners Dog and Best of Winners for one more point. Three total points for the weekend, 12 more points and two majors needed for his championship. Good start for his very first weekend out! I am very proud of my puppy boy.